The motoring world was left in a flat spin when the original Bugatti Veyron was unveiled way back in 2005. The French-built mid-engined hypercar shattered expectations, defying physics and refining the term “fast”. Here was an otherworldly-looking thing, packing an 8.0-litre W16 engine (with as many as four turbochargers) worth around 736kW and 1250Nm. Top speed was pegged at a mighty 407km/h, with all of that oomph transferred to the pitiful tarmac via a seven-speed dual-clutch transmission and permanent all-wheel drive. A few years later, Bugatti added the Grand Sport version, which was essentially a roadster with a pair of removable tops. Nice. But the one that received the most attention was the venerable Super Sport variant. For this 30-model run, peak outputs were raised to a startling 880kW and tar-ripping 1500Nm, while a revised aerodynamics package was also adopted. The result? 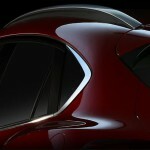 A new electronically limited top speed of 415km/h. But the Volkswagen-backed automaker soon went one step further in its quest for extreme speed, building five Super Sport World Record Edition models, each of which could reach a face-melting 431km/h. Fastest production car in the world? Well, Guinness reckoned so, even if Hennessey and its Venom GT begged to differ. The open-top Vitesse was later added to the range, along with a generous helping of special edition models as the production run wound down. Eventually, at the start of 2015, the final Veyron found its way onto a no-doubt delighted customer’s Middle Eastern driveway. So, despite more than a decade having passed, the evergreen Veyron was still a giant among hypercars, even if the game had moved along a little (with the likes of Porsche, Ferrari, and McLaren having gone the hybrid route). 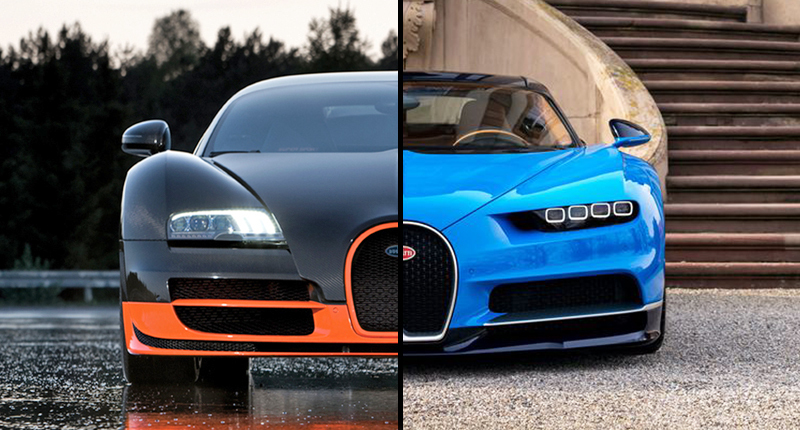 But Bugatti has now replaced the revered Veyron with a vehicle even more outrageous. And the Chiron is that new exercise in excess. Here’s how the newcomer stacks up against the most powerful of its predecessors. Just like the Veyron, the Chiron is a mid-engined two-seater employing an 8.0-litre W16 quad-turbocharged petrol mill and all-wheel drive (no hybrid frippery here, then). But this behemoth of an engine has benefitted from myriad alterations: it now boasts direct injection, while the turbochargers are both larger and smarter, apparently drastically reducing lag. Peak power is a quoted 1103kW, a whopping 223kW (about what a Honda Civic Type R churns out) more than the already ludicrously well-endowed Veyron. Maximum torque, meanwhile, rises to a mammoth 1600Nm, which is on tap from around 2000rpm pretty much all the way through to 6700rpm. The angriest delimited Veyron could hit 431km/h (although the official figure was 415km/h). 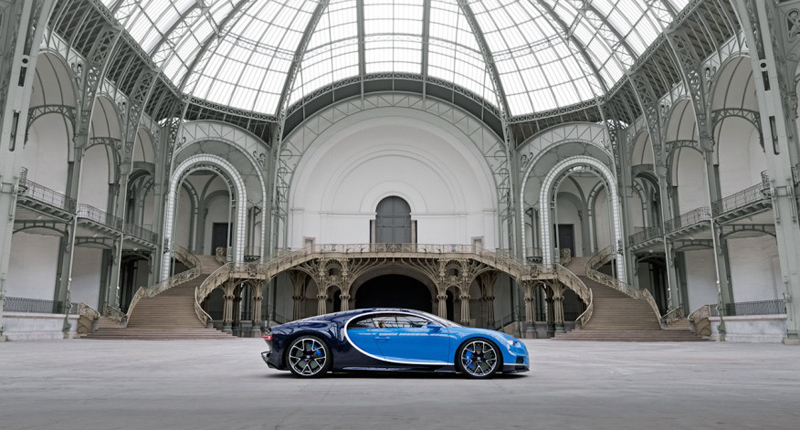 The new Chiron, however, is electronically limited to 420km/h. Disappointed? Don’t be. Bugatti will all but certainly unveil an even faster model (as it did with the Veyron when it created the Super Sport) in the near future, with the promise that the next batch of performance figures will set yet more records (who knows where it’ll end with the limiter removed?). For what it’s worth, the new Chiron’s speedometer reads all the way up to 500km/h. As it stands, the automaker hasn’t provided an official zero to 100km/h time for the newcomer, although it has confirmed that it will be “less than 2.5 seconds”. The Chiron will also apparently hit 200km/h in less than 6.5 seconds, while the 300km/h-mark is obliterated in less than 13.6 seconds (you guessed it… quicker than the Veyron). Interestingly, the Bugatti Chiron is actually somewhat heavier than its predecessor, tipping the scales at around 1995kg. Yes, despite a pretty comprehensive weight-saving programme, the Chiron is forced to lug around some 150kg more lard than the Veyron. That’s like having a sumo wrestler permanently crammed into the passenger seat. 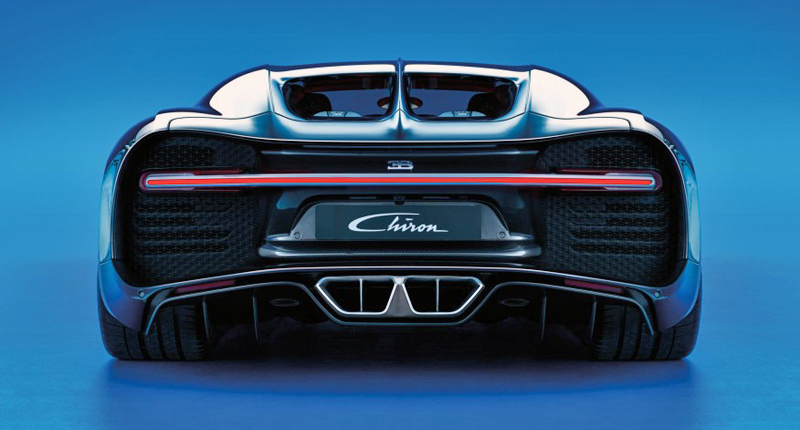 But, considering its substantial under-bonnet upgrade, the Chiron’s power-to-weight ratio is clearly the better of the two – hitchhiking sumo or not. And one must keep in mind that it’s still a luxury vehicle, with its soon-to-be-owners expecting a lofty level of comfort and on-board technology (which doesn’t exactly make cutting weight simple). Over a ten-year production period, Bugatti bolted together a total of 450 Veyron models, made up of approximately 300 coupes and 150 roadsters. The very last one was dubbed the Grand Sport Vitesse La Finale. So, what’s the company’s strategy with the new Chiron? Well, it plans to produce some 500 units, with nearly 170 of those slots having already been secured by what the brand calls “serious purchasers” (each has put down a substantial deposit). Saving up for one of the remaining 330 units? Well, here’s some advice: save harder. 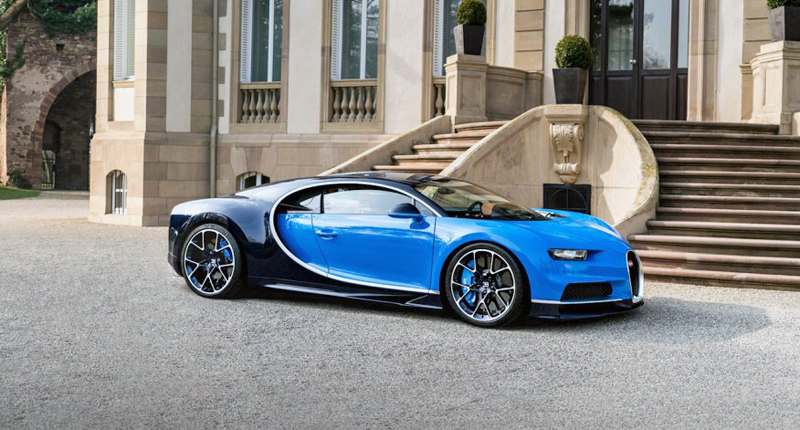 The new Bugatti Chiron will be priced from about $2.65-million (as opposed to the $1.7-million starting price for the base Veyron at the end of its life in 2015). Fascinatingly, Bugatti has made it known that the Chiron, unlike the Veyron, is actually expected to make the company some money. Of course, the Veyron is still a rare and sought-after vehicle. In fact, there’s a low-mileage 2013 Bugatti Veyron Grand Sport Vitesse World Record Edition currently for sale in the United Kingdom… for the princely sum of $2.5-million.